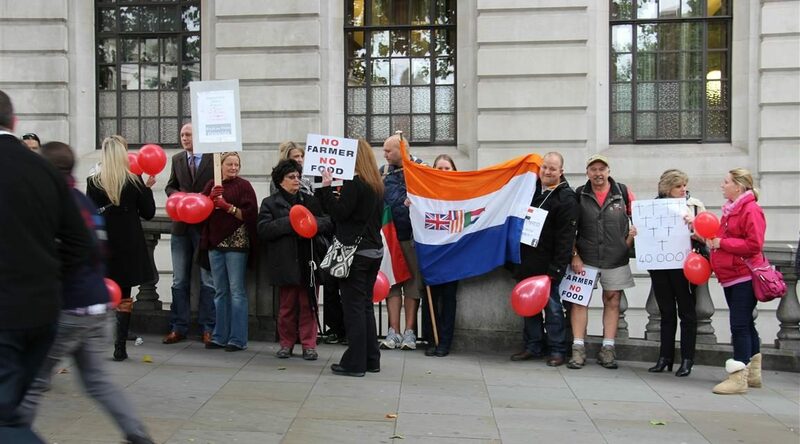 Old South African Flag displayed in a farm murder protest. Symbols, like words, communicate meanings. As such, symbols are hardly ever “just objects” — they are the bearer of meanings. Like anything, the meaning of a symbol can be contested and will ultimately rest on some form of societal consensus (and this meaning can change again over time because society is not static). A flag is a cultural symbol and a powerful one as such. So powerful, that it is sometimes banned for the meaning it carries. The Nazi flag being banned in Germany is one such example. The old South African flag that often pops up in conversations about farm murders is one such symbol and something that should be worrying anyone who claims that, “This is not a race thing.” We saw the meaning of the flag being contested as a result of the circulation of images (and admittedly some were from other farm murder protests and not #BlackMonday). When trying to ascertain meaning, context is always important. While watching the conversations about the old South African flag, I found Charlottesville, Nazi symbolism and the debates about the Confederate flag in the US coming to mind. Earlier this year in the US, there was a debate surrounding the use of the Confederate flag. On the one side you have people who argue that it is a symbol of racism, pointing specifically to the creator of the flag stating that, “As a people, we are fighting to maintain the Heaven-ordained supremacy of the white man over the inferior or colored race” and that the flag is a symbol of that, while others argue that the flag has nothing to do with racism but more with the heritage and culture of the American South, or that it simply means “people fought and died” (in the American civil war) and for this reason is historical memorabilia. The debate about the Confederate flag and a vote as to whether to keep it or not showed that the discussion about its meaning and the differing opinions about it is a symptom of a polarised society: 90 percent of whites wanted to keep it (in Mississippi), while 95 percent of black people voted for the option to have a new flag. Conversations around the flag are mostly dominated by “us and them” language. Dylann Roof, the suspect in the Charleston church massacre where nine black churchgoers were gunned down, posed shamelessly with the flag in various pictures. Inevitably the conversations about the flag and what it symbolises are steeped in history. What is the origin? What did it represent? Can the meaning of a flag change with the times? And if so, has it? An interesting study showed that white Southerners that support the Confederate flag exhibited particular characteristics: they are generally less knowledgeable about the history, more intolerant toward interracial dating and tend to deny that black people are discriminated against in the labour market (despite statistics showing otherwise). This will then negate the argument that it is the respect for Southern history that drives the love for the flag. White people who are more knowledgeable about Southern history tend to support the flagless. In this sense, love of the flag can be seen to symbolise ignorance of its history, and this tends to disprove that the flag is merely about history. When I saw the few images and videos (and I understand some of the images were old and of previous farm-murder protests), this debate rang in my head. I wondered what the results would be if we did a similar study in South Africa. Understandably the images evoked emotional responses all over the spectrum of political (and civil life, for as far as it is not strictly political) in South Africa. 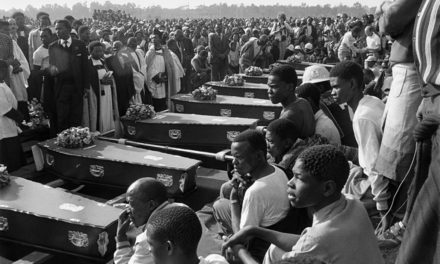 President Cyril Ramaphosa condemned the display of the flag, seeing it as a symbol of people who “hanker for apartheid”. Roelf Meyer, a National Party politician who is known for his role in the negotiations to end apartheid, said he regards it as a symbol of extremism. A woman interviewed about the flag on her biker jacket stated how she felt protected under the old South African flag. Do we know the history and the system that this flag represents? On the one hand, one should give it to the woman who thinks back on the “good old days” — apartheid as a system was geared to make her life comfortable while making the lives of black people a living hell. And this all sounds okay if one disregards that it was a crime against humanity. And then, of course, there are many moral questions about the enjoyment of privileges bestowed by a system that is, at the same time, committing a crime against humanity (for which, I should add, very few of its leaders or agents were ever prosecuted). We should therefore not be surprised at the outrage over the use of the old flag — regardless of whether it was displayed widely or only in isolated incidents. And I want to argue that the appearance of the flag is a symptom of a society that, on the whole political spectrum, is questioning exactly the compromise, the shared future, that the new flag is supposed to symbolise. So, why does this matter? The answer might lie in the relationship between symbols and how we view the world around us. Accepting or rejecting a political symbol with a very specific meaning indicates something about the state of our nation. We should ask questions about the meaning of these symbols and their places in the national conversation. Germany has laws banning Nazi symbols. They have Volksverhetzung, where the waving of the Nazi flag can be seen as a “incitement to hatred” and a call for action against a certain segment of the population. The use of a symbol is regarded as a direct call to action against a particular ethnic group. Arguably, the old South African flag symbolises the apartheid regime and its ideology, the idea that one race is more worthy of being protected than another, and the idea that black people are savages and somehow less human and should be treated as such. It is a denial of equality, of equal human dignity — and as such, it is unconstitutional. 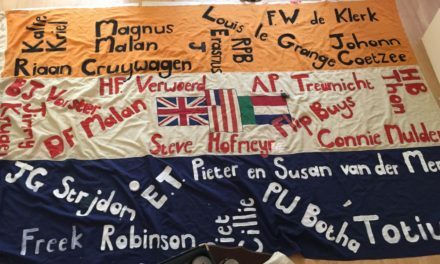 If the groups who hijacked any attempt and meaningful conversation about farm murders want to deny that this is the premise on which the fight against the murder of farmers is based, there should be an outright condemnation of the use of the (old South African) flag and what it symbolises.